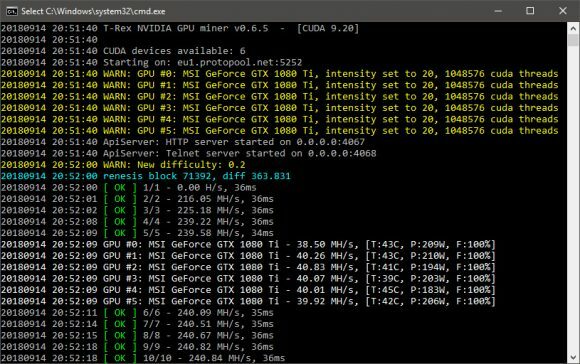 Another quick update to version 0.6.5 for the T-Rex Nvidia GPU miner that brings support for yet another new algorithm – bcd, along with some slight improvement to the performance of some of the supported algorithms. The new T-Rex 0.6.5 should bring a speed improvement of about 2-3% in X16r and X17s, Bitcore, Renesis and HMQ1725 over the recently released previous version T-Rex 0.6.4. A speed improvement of about 1-3% should also be available for X17, C11 and Sonoa algorithms that the miner also supports compared to the hashrate from the previous release. Do note that the T-Rex is a closed source miner with 1% development fee built-in. Also make sure you have a recent video driver installed as the binaries for both Linux and Windows are compiled for CUDA 9.1/9.2.